Reax: Wang, Snow | Gordon | "E"
LOS ANGELES -- The weather on Long Island is about to change because El Nino is coming to town. Nino Niederreiter is the newest New York Islander as Garth Snow made the announcement in front of a packed Staples Center at the 2010 NHL Entry Draft. The selection of the Chur, Switzerland native didn't come as a surprise to some, but it caught Niederreiter just a little off-guard. "I couldn't believe it actually. My mom almost cried and I gave my dad a hug. It's just unbelievable," Niederreiter said. He also had the honor of becoming the first European to be selected in the draft. "I couldn't be happier. I think when you go fifth overall its unbelievable, and being the first European -- someone told me that, it's just great," an excited Niederreiter told NYI.com. Islanders General Manager Garth Snow believes that the addition of the young Niederreiter will be extremely beneficial to the team's future. "He's a big power forward, he can score goals, he's a great kid," Snow said. "There's a lot to like. We're excited about him." 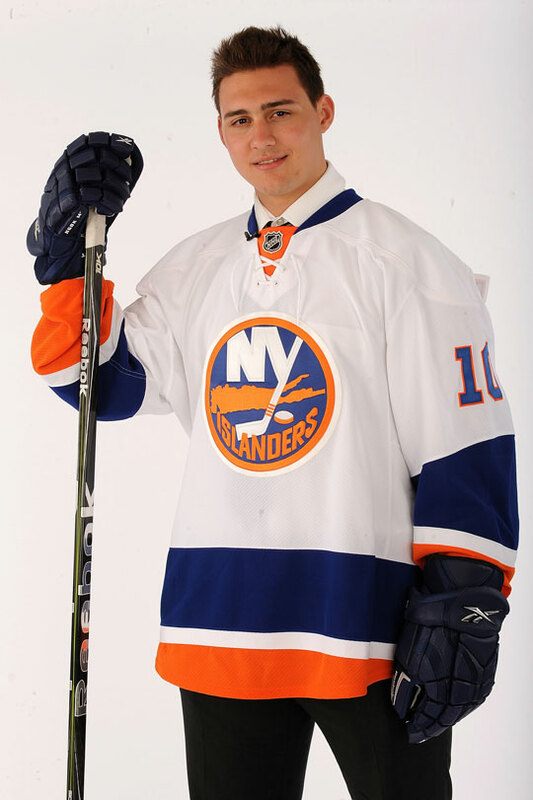 Will Islander fans be able to see Niederreiter in an Islander uniform come this winter? Maybe, but they'll have their first chance come training camp. "It's a big summer for him training wise," Snow said. "He'll come to training camp and he'll have to play well." The addition of the 18-year-old Switzerland-native means that Mark Streit will have a fellow countryman roaming the lockerroom. "To be a part of the Islanders and the North Swiss skies with Mark Streit, its just awesome," Niederreiter said. "I was on the Island for a mini-camp earlier, and we just said hi to each other. Its just great to have him there." Niederreiter played his rookie season in the Western Hockey League, leading the team in goals with 36 and registering 24 assists for 60 points in 65 games with the Portland Winterhawks. The 18-year-old center appeared in 13 playoff games, notching eight goals and eight assists for 16 points. On the international stage, Niederreiter represented Switzerland at the 2010 World Junior Championship, where he lead the team with 10 points in seven games (6 goals, 4 assists). He was named to the tournament all-star team. While Niederreither stock rose greatly after his World Championship performance, the Islanders and Garth Snow had their eyes on previously. "It rose not just because of the World Juniors but he was a player of interest early on in the season (to us)." So is the newest New York Islander excited to begin his journey with his new team? "I'm really excited to come over here, the fifth overall selection said. "They're a young team and they look to be getting better and better... I'm just happy to be a part of the Islanders."